Kontu informati? Did you know? Eravate informati? Archbishop Rahho's body was found buried near MosulPaulos Faraj Rahho, the Chaldean Catholic archbishop in Iraq who was kidnapped last month, has been found dead near the northern city of Mosul. An Iraqi police officer and morgue official confirmed reports that the archbishop's body had been found buried near Mosul, where he had been abducted. 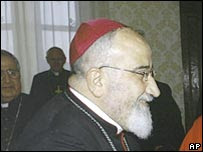 The Vatican said Pope Benedict XVI was profoundly moved and saddened by Archbishop Rahho's death. He was kidnapped soon after he left Mass in Mosul on 29 February. According to the SIR Catholic news agency, the kidnappers told Iraqi church officials on Wednesday that Archbishop Rahho was very ill and, later on Wednesday, that he was dead. The archbishop was the latest in a long line of Chaldean clerics to be abducted in Iraq since the US-led invasion in March 2003. Three people who were with him at the time were killed by gunmen. A Vatican spokesman, Father Federico Lombardi, said: "The most absurd and unjustified violence continues to afflict the Iraqi people and in particular the small Christian community, whom the Pope holds in his prayers in this time of deep sadness". Earlier in Iraq, a car bomb in the capital Baghdad was reported to have killed at least seven people, and wounded at least 20. According to AP, the bomb was in a parked car in Tahrir Square, a central commercial district just outside the heavily fortified Green Zone, which houses much of the Iraqi government and the US Embassy. Common sense prevails. At last!